Johnny Cash in his final album sings a particularly stirring rendition of the folk song Cowboy's Lament, also known by part of its first line as "Streets of Laredo." (Side note: The Kingston Trio sings a decidedly more whimsical version, but Cash's version is better). The song chronicles of the life of a Cowboy who "used to go dashing," but "got shot in the breast" and is "dying today." 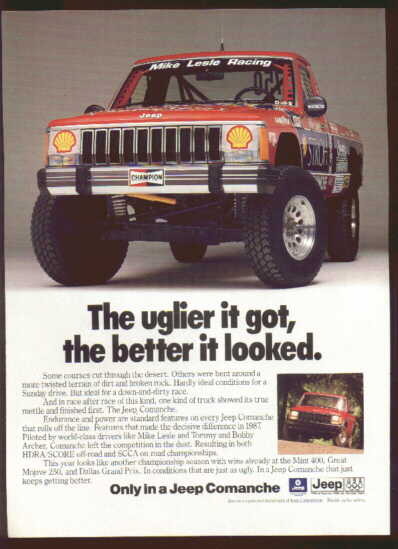 It is a fitting name for the mid-level Jeep Comanche as it embodies a certain degree of Cowboy cool and also died young. 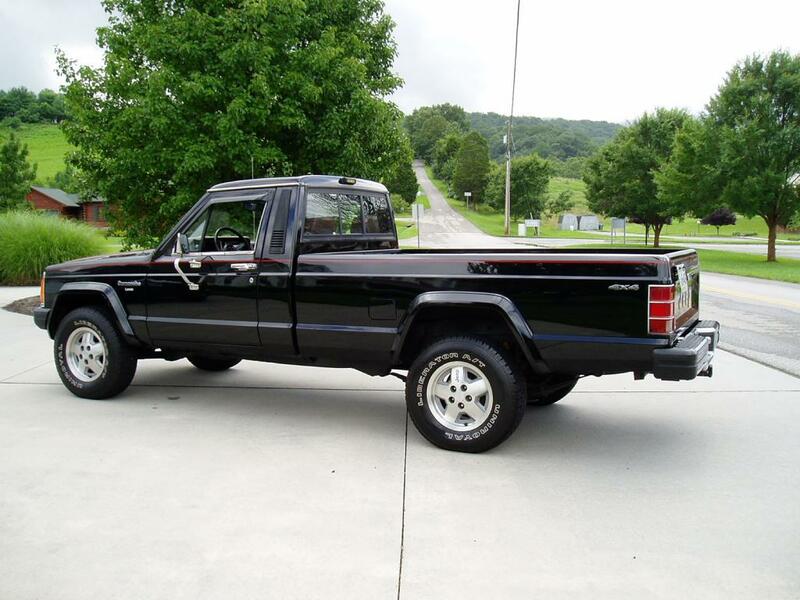 Find this 1987 Jeep Comanche Laredo 4X4 5-spd for sale in Shawsville, VA currently bidding on ebay for $5,101 with 3 days to go. Tip from IgnatiusReilly. 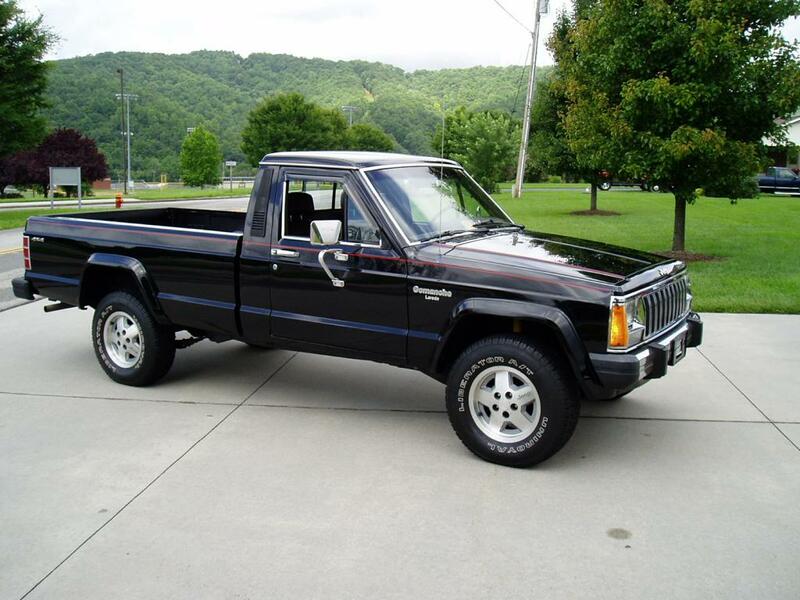 The Comanche was a departure from typical AMC based pickups, as it eschewed the use of classic truck body-on-frame construction and used a car-like unibody setup shared with the Cherokee SUV for the front half, a pair of sheetmetal frame rails welded to the cab, and a separate bolt-on bed. The result is a "Uniframe" hybrid that drives like a car, but can still haul a bunch of junk like a truck. It was ahead of its time for 1986, and few body-on-frame small pickups remain in production today. A picture of the exposed rear Uniframe can be found here on The Truth About Cars. This Comanche is powered by a 4.0 liter AMC 242 cubic inch inline six, mated to a 5-speed transmission and all four wheels. The AMC 242 puts out 177 horsepower and 224 ft-lbs of torque and it should be able to move the Comanche out of its own way. Current bidding is a decent price for a good hauler, around town car and conversation piece. Wow, talk about a time capsule! I rarely see these anymore and I've never seen one in this condition. I assume the downside of the uniframe must have been rust because you really don't see many of these survivors.